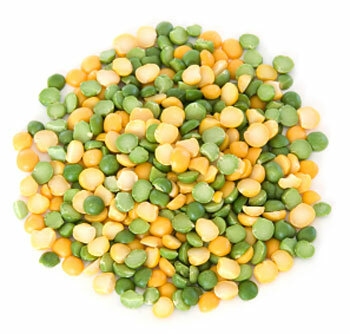 Dried split peas are often found in the bulk section of the grocery store, or prepackaged in bags on the shelf. If they seem rather mysterious to you, let this be the month that you give them a try! Split peas are so called because of their shape – when fresh, they are actually round (like the more familiar frozen green peas). They split into their two halves after being harvested, peeled and dried. They are available pretty much any time of the year, and belong to the same family of plants as beans and lentils. The two most common varieties you are likely to find are green or yellow in color. Like their relatives beans and lentils, split peas are a great source of plant-based protein packed with fiber and almost no fat. The high fiber load includes soluble fiber, which has been shown to lower blood cholesterol levels as well as help manage blood sugar levels. In addition, peas contain phytonutrients called isoflavones. Consumption of isoflavones in certain populations has been associated with lower risks of certain cancers, such as breast or prostate cancer. To top it off, peas are also a good source of folate and thiamin (Vitamin B1), as well as potassium, a mineral that plays an important role in lowering high blood pressure. Since split peas are dried, they will keep in the pantry for a few months. Before using them, pick over to remove any debris or bits of dirt or stone. Split peas do not need to be pre-soaked before cooking; just give them a rinse before popping them on the stove with water. (Generally, you will need about 3 cups of water or broth for every cup of dried split peas.) Similar to cooking other dried legumes, bring the peas to a boil, then cover and simmer until they are tender. Split peas should be tender within 20 to 30 minutes.